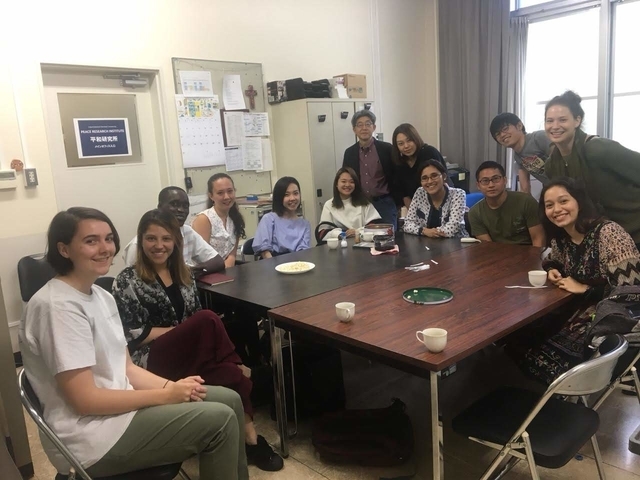 Students across various disciplines and cultures came together on Thursday, September 20, for PRI's first Peace Cafe of the new semester. In attendance were 11 graduate and undergraduate students. Over coffee and popcorn, students introduced themselves and shared their visions of peace. Future meetings and activities related to PRI were discussed and suggestions for subsequent Peace Cafe gatherings were shared. Peace Cafe is a monthly event sponsored by PRI. Students bring forward topics of discussion and have in the past also responded to current events, providing senbazuru (one thousand paper cranes) last year to a community in Okinawa that had a war memorial site destroyed. Join in these monthly events by checking our website or the portal.